Home Cellular Can the FCC Handle Phone Service over the Internet? Can the FCC Handle Phone Service over the Internet? Regulating IP telephony will be like updating the rules of the road from horse-and-carriage traffic to modern automobiles. Slowly and carefully, the FCC is circling around a problem that may be its hardest ever. The digital TV transition? Piece of cake. First-on-the-planet incentive auctions? No sweat. But this one is tough: nothing less than a remake of the U.S. telephone system, all 120 million phones and 1.5 billion miles of wire. The engineers and entrepreneurs have gotten out ahead of the FCC lawyers. Now the lawyers are scrambling to catch up. Imagine you’re Alexander Graham Bell. It’s 1876. You’ve just finished constructing the first two working telephones. You have made the first ever telephone call, to your assistant in another room: “Mr. Watson, come here, I want to see you.” The call needed a pair of copper wires between the telephones, to carry an electrical signal whose variations matched the sound waves of your voice. Now you’re ready to scale, as we say these days – to start the rollout that will place a telephone in every home and business. Your problem: just like that first time, any two telephones on a call must have a pair of wires connecting them. That was basically the phone system for the next 125 years. Improvements came mainly in better ways of handling the switchboard function. 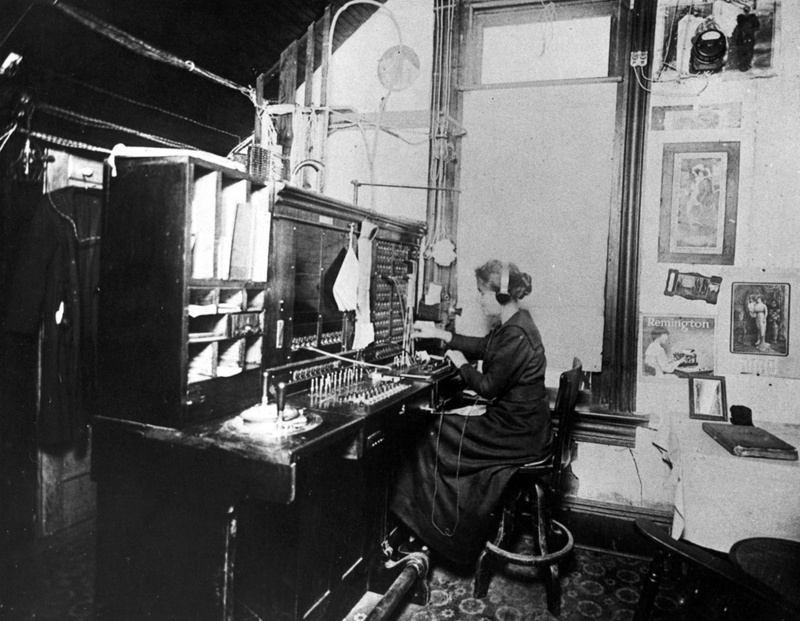 The young-women operators gave way to noisy, clunky Strowger switches that let customers establish their own connections by dialing numbers on their phones. Decades later, fast, reliable crossbar switches replaced the Strowgers. Decades later still, computer-based switching systems supplanted the crossbars, offering features like call waiting, caller ID, and call forwarding. All of these technologies serve the same function: creating a direct, metallic connection from one telephone to another. Dialing a number – or later, punching the Touch-Tone buttons – puts in motion a cascade that ripples through the system, setting up connections from one switching office to the next, sometimes a dozen or more, from your telephone all the way to the individual telephone being called. When you hang up, another message goes out to take down these connections, freeing up the lines and switches for other callers. The AT&T and Bell Canada long-distance divisions, beginning in the 1950s, replaced some of the intercity copper wires with microwave radio. Each call, though, still had its own dedicated circuit, now running partly over radio facilities. When the microwave systems converted to digital transmission in the 1970s, each ongoing call acquired its own time slot, rather than a separate circuit, but the principle of dedicated facilities remained. This is “circuit switched” telephony, in which switches create separate, temporary circuits for each call. Insiders call the system the “public switched telephone network,” or PSTN. It provides POTS: “plain old telephone service,” dial-up voice communications and nothing else. Most countries made the telephone system a government function, typically part of the post office, but the United States and Canada kept it in private hands. Both countries began regulating phone service around the 1930s. Local phone companies had to provide service to anyone who asked. Rather than make rural customers pay the full cost of installing their expensive lines, regulators told the companies to average out the costs among all customers in the area. Each company had to physically interconnect with the others, so that any phone could call any other phone. Tariffed rates kept phone companies from discriminating unfairly among their customers. Rate regulation held profits at reasonable levels, yet encouraged investment in reliability and modernization. Charges for long-distance service, used mostly by businesses, were set artificially high to subsidize local service, and thus keep it inexpensive for consumers. The U.S./Canadian telephone system that resulted was the envy of the world. Despite its stunning complexity – by far the most complicated machine of its time – the system operated with near-perfect reliability, except sometimes on Mother’s Day. Even when ice storms and hurricanes knocked out power, picking up the handset almost always gave a dial tone. Sending digital information over wires is not new. In fact, it’s very old. Morse code telegraphy, which goes back to the 1840s, is a form of digital transmission. So are teleprinter machines, such as Teletype, which displaced Morse for sending text around the middle of the last century. The major U.S. teleprinter service, Western Union’s Telex, operated its own switched-circuit system that paralleled the telephone system. Nineteen-sixties-era computers, although big, slow, and expensive, were moving into commercial applications such as billing and accounting. That created a need to move quantities of data from one place to another. Some early applications used modem signals over ordinary phone lines – a precursor to the dial-up Internet. Systems needing to cover longer distances could connect their computers to Telex lines which, although slow, were less expensive than long-distance telephone, and were highly reliable. I worked on one such system in the early 1960s that controlled a 3,500-mile natural gas pipeline from a central location, over the Canadian equivalent of Telex. A decade later, with computers becoming smaller, faster, and cheaper, modem and Telex speeds no longer sufficed. The phone companies offered high-speed data transmission over dedicated lines, but at costs too high for many applications. Fortunately, a new communications technology promised to meet the need: packet switching. A packet-switched network superficially resembles a circuit-switched network, consisting of switching facilities connected by lines (or radio links or fiber-optics). There the resemblance ends. Where circuit switching reconfigures the wiring in advance for each call, packet switching leaves the network unchanged and instead routes pieces of the message on the fly. The computer sending a message hands it off to an access point, called a host, that separates the message into chunks (packets) of uniform size, typically between 1024 and 524,280 bits. The host adds to each packet a “header” that carries the destination address along with other needed information. The host transmits the packets, one at a time, to a switching point, called a node, in the general direction of the destination. Equipment there inspects each header and directs the packet to another node, one still closer to the destination. The packet migrates in this way through the network, from node to node, until it reaches another host at the destination. There the host strips off the headers, reassembles the packets into the original message, and delivers it to the recipient. Some systems, including the Internet, allow the packets for a given message to travel by different routes, possibly arriving at the receiving host out of order and requiring reassembly. Other systems use the first packet to drop a trail of electronic breadcrumbs that subsequent packets must follow, so that they reach the destination in sequence. There can also be arrangements for prioritizing packets, instructing the nodes to pass through urgent messages first. But the phone companies liked the status quo. They still owned the massive switched voice network, also reliable and mostly paid for, from which they hoped to keep extracting revenues. It took the growth of the public Internet, and particularly the spread of broadband connections to homes and businesses, to bring about change. Many peoples’ computers were sending and receiving email and web data over the collection of packet networks called the Internet, using standards called Internet Protocol, or IP. Beginning ten years ago, a few start-ups began offering digitized voice over Internet Protocol – VoIP: a telephone-like service that ran over the Internet via a broadband connection to the user’s premises. Consumer VoIP now comes in two main types: “interconnected VoIP,” which can place calls to and receive calls from ordinary phones, using ordinary phone numbers, and non-interconnected VoIP that usually connects through a user’s computer and does not have its own traditional phone number for receiving calls. Some non-interconnected VoIP services are free. Although interconnected VoIP entails a monthly charge, that may include low-cost calling to much of the world, with an overall bill that is often far less than that for traditional phone service. Moreover, an interconnected VoIP user can obtain a phone number unrelated to his actual location. A user in Australia, for example, who has family and friends in New York City, can request a number with New York City country and area codes. Calls from New York City to Australia become local calls at local rates, while calls from Australia back to New York City go at low VoIP rates. Although interconnected VoIP originally substituted for wireline phone service, the spread of smartphones changed that. A smartphone can use a VoIP connection over Wi-Fi or 3G/4G data services to send and receive mobile calls without eating into expensive cell plan minutes. VoIP presents the FCC with a doctrinal conflict. On the one hand, VoIP is an Internet application, and the FCC has long forborne from regulating Internet applications. This principle says: leave VoIP alone. The economics dictate that more and more telephone users and functions will migrate to the Internet. Some public interest advocates view this trend with alarm. In particular, they fear losing hard-won consumer protections that benefit PSTN users. Their concern may have some basis in history. Back in the dial-up Internet days, thousands of independent Internet service providers (ISPs) flourished under rules that gave them equal footing with the telephone companies’ own ISPs. But the FCC dropped those rules for broadband. The telephone and cable company broadband providers duly locked out the independents, leaving them no way to reach their customers. Today, except for wireless ISPs that provide their own broadband connections, the independents are mostly extinct. VoIP providers are likely to argue, as the broadband providers did, that traditional telephone-line protections are infeasible or unneeded in an Internet age. Here is one example of the coming problems. Running telephone lines to deeply rural areas and isolated Indian reservations is expensive. But the phone companies do it anyway, and they spread the cost, because the rules require it. Mobile service providers, in contrast, have no comparable obligation to reach every potential customer. The cell companies accordingly can (and do) omit base stations that would serve only small numbers of people. This leaves many rural and reservation residents with no access to the mobile voice and data services that the rest of us take for granted. Will the FCC regulate the coverage of IP telephony like wireline phones or like mobile phones – or possibly some other way? One theoretical solution is to leave VoIP providers lightly regulated, yet still require the traditional phone companies to continue serving anyone who asks. But if VoIP picks off the low-cost urban and suburban markets, leaving the traditional companies with just the expensive rural customers, those customers will pay high rates. Requiring VoIP companies to serve everyone does not work, either; VoIP needs broadband, and providing broadband to remote locations is even more expensive than running wireline service – although ubiquitous broadband service would have a lot of social value. The answer may be a fund that all providers, whether wireline or VoIP, would pay into, and that would subsidize rural and reservation service – somewhat like the present high-cost component of the universal service fund, but with much of the revenue coming from outside the conventional telephone industry. Multiply this issue by every other facet of telephone regulation. The overall task will be something like updating the rules of the road from horse-and-carriage traffic to modern automobiles. There is an added complication. Local wireline service is a tough market to get started in, even as a non-incumbent competitive local carrier. Accordingly, there are relatively few companies to regulate. But almost anybody can become a VoIP provider. With cloud services bringing down the costs of entry, VoIP companies are likely to spring up all over. The competition will undoubtedly be good for customers. But for regulators, collecting payments and reports from multitudinous small providers will be a major headache. Today the states have a large role in regulating local wireline telephone service, but no jurisdiction over the Internet. At first glance it makes little sense to extend or replicate the states’ present wireline authority in order to allow them to regulate VoIP – if it is possible at all; a customer with an in-state phone number might actually be far outside the state. But governments do not easily give up their powers, and the states may fight for the right to protect their citizens. Finally, the current policy of regulating only interconnected VoIP, while leaving non-interconnected VoIP nearly untouched, cannot survive indefinitely. There used to be a marked difference between the two: where interconnected VoIP needed no special skills, the typical non-interconnected VoIP customer was a highly computer-literate person with a headset plugged into a laptop. But then smartphones appeared. They combined the functions of both the headset and the laptop, while VoIP apps eliminated the need for computer skills. A lot of the people chatting on their phones at Starbucks may well be using VoIP. Many of the apps can dial out to any phone number. But because they have no number themselves for dialing in, they are deemed non-interconnected, and hence are mostly unregulated. Sooner or later, the providers will work out ways for their customers to call each other without using phone numbers at all. Regulatory efforts that continue to ignore these apps and their providers will miss a large piece of the industry. That will put more of the regulatory burden on interconnected VoIP, which will drive still more users to the non-interconnected apps. If the FCC wanted to, could it apply full telephone regulation to the non-interconnected providers? Its statutory mandate does not obviously extend that far. Besides, providers could easily locate off-shore, outside the FCC’s reach. And even just identifying the myriad of providers and their untold numbers of customers could be a formidable task. Not many people think that completely unregulated telephone service is the right outcome, but we may be heading in that direction at accelerating speeds. A recent meeting of the FCC heard a high-level presentation on some of these issues. Experiments are planned. It is good to see the FCC getting started. But they sure have a long way to go. Thanks for the time and effort you put into this, Mitchell. I’ve been looking for something I could use to explain the PSTN sunset challenge to non specialists. Very well written and clear. Not bad not bad at all but you still confuse Voice Over IP aka Vonage with Voice Using IP which is Cable and FIOS. Dont worry everyone does it. We the engineers will have something to say about this shortly. You can see all my filings on FCBA..
Richard Shockey’s point is crucial here. The PSTN didn’t “end” when its internal signalling moved from manual cord boards to MF or from MF to SS7, and the move from SS7 to IP is no different. The PSTN is defined by criteria like mandatory interconnection, , settlements, and access to 911. It makes about as much sense to say the Internet and the PSTN are the same because they both use IP as it does to say a jet plane is a tractor because they both use kerosene. There are some real arbitrage issues, and funding of public service and universal service functions, but they’re not hard to solve once you understand what you’re regulating. Or looking at it another way. The PSTN is 3 things. 1. Anyone to Anyone. That implies 251 interconnection is some way shape or form, though like the Internet those agreements could be more voluntary. Note less than 7% of all voice minutes are real VoIP like Skype etc. PSTN voice across all platforms is still about 140 Billion in revenue per year. 2. 911 that is a central value proposition here and an essential public good. 3 The persistent identifier. The phone number. If we do this right we can have national geographic number portability. At least technically we may actually be able to get a better service out of this. Wow actually take a conference call on a mobile device .. HD Voice? How novel. Of all the assorted regulations in question, only E911 is an embedded public good. The other requirements amount to economic subsidies of one kind or another. The E911 system evolved under the assumption that subscribers could be located based on assigned telephone number. With cellphones quickly displacing wireline phones, that assumption is no longer valid. The Congress can enact taxes to cover any rural connectivity subsidies it thinks appropriate, perhaps avoiding some of the unintended consequences of present policy. And E911 should be scrapped in favor of a dedicated emergency button or even an embedded application capable of self activating in case medical emergency. The dial – talk – wait model is simply no longer relevant. A smaller FCC role will naturally give rise to the sorts of innovations the IP medium is capable of. To the extent the FCC attempts to regulate along the lines of the present wireline regime, the possibilities for innovation will be fewer. Phone Service Providers plays important role in telecommunication in the world. every one needs phone connection at their residence or at their office for communication in this mobile world because the work done on land line phone are not able to do properly on mobile devices. I’ve been doing some research and wondering do the patents that Voip-Pal (an IP company) just acquired from USPTO regarding the VoIP industry come into play with the new FCC proposal? Their BOD, who are industry experts, believe that anyone using VoIP is infringing on their patents and they are trying to find a licensing deal with a major Telco player and eventually be acquired for their IP. I’d like to hear your insight since it you probably are more familiar with the market than most. ARP — Ordinarily the FCC regulates without regard to patent considerations. Unfortunately I personally lack the patent expertise to have an opinion on the infringement question you raise. Maybe someone more knowledgeable will step forward.